Apparently Nitsirk is sending 'surprise art to various people' and I am one of the lucky recipients! This piece, 'Pep Talk With Self' is no 2 in the series of two. Do you have or have you had imaginary friends? Nitsirk admits she has had her share. I never remember having an imaginary friend, myself, and although our daughter didn't have an imaginary friend, per se, she did have an imaginary school bus (The Chinese New School Bus - we lived in Singapore at the time). What I remember was the way we would be whipped up into a frenzy to meet the bus, suddenly. 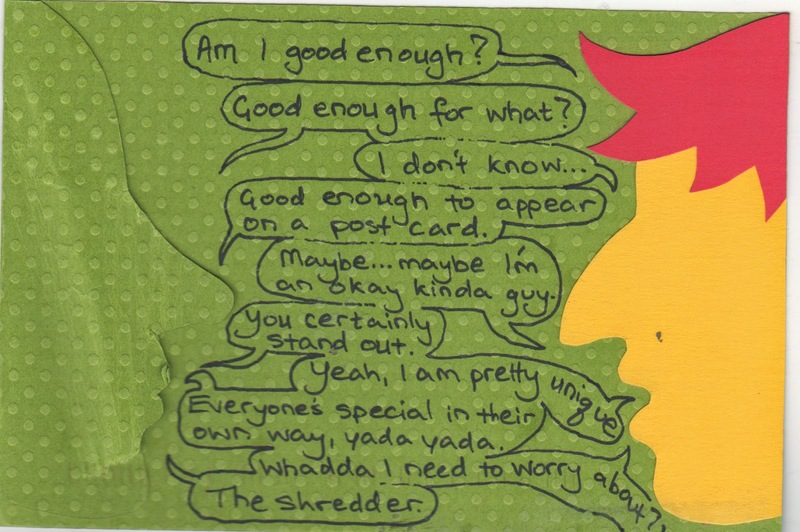 The green background is a wonderful dull olive colour and that character with the red hair may say more about other's opinions of us than who we really think we are… I'm curious about whether the green profile was meant to be bent and slightly torn - shredded - or whether that happened in the mail! Thanks Nitsirk, I will send you something soon.